LONDON (Reuters) - Asda, the British supermarket arm of Walmart <WMT.N> reported a 2.6 percent rise in quarterly underlying sales, showing its recovery was gaining speed ahead of an expected takeover by bigger rival Sainsbury's <SBRY.L>. Sainsbury's agreed in April a 7.3 billion pounds cash and shares takeover of Asda - a combination that will overtake Tesco <TSCO.L> as Britain's biggest supermarket group if it is approved by competition authorities. Asda said on Thursday that underlying sales excluding fuel, rose 0.4 percent, in its fiscal second quarter. Removing the impact of Easter which this year benefited the first quarter, they grew 2.6 percent. That compared to sales growth adjusted for Easter of 1.0 percent in the first quarter. 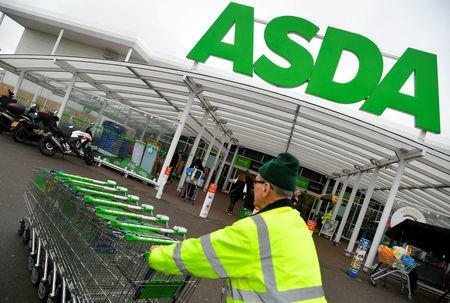 Asda said that its second quarter performance was boosted by new shoppers, stronger online sales and the launch of new products such as vegan falafal burgers and a gin range with flavours such as rhubarb and ginger. The strong performance chimed with data from market researcher Kantar Worldpanel which showed the recent turnaround of Asda's fortunes. It emerged as the best performer in terms of sales growth of the big four supermarkets over the 12 weeks to July 15, the first time it has done so since December 2014. "We remain focussed on delivering our strategic priorities and investing in the areas that matter most to our customers - innovation in our own brand, lowering prices and in continuously improving our shopping experience both in store and online," Asda president and chief executive Roger Burnley said. Asda's recent performance has put Sainsbury's in the shade. Last month Sainsbury's reported its retail like-for-like sales growth had slowed to 0.2 percent in its fiscal first quarter. Separately on Thursday Walmart beat second-quarter sales forecasts and grew its U.S. e-commerce sales by 40 percent in the period.